A self-storage unit is a convenient and secure way to store items that you either don’t have the space for, or currently do not have a use for. That being said, there are certain items that you should not store, and may even be prohibited from storing in your storage space. Here are 5 categories of items you should not keep in self-storage. Hazardous materials. For obvious safety reasons, there are just some things that cannot be stored safely in most self-storage units. Toxic or flammable substances such as gasoline or crude, explosives such as fireworks, bio-hazards, weapons and ammunition need to be stored safely and in accordance with provincial and federal laws. Organic matter and perishable food items. Many people keep canned food and jarred preserves in their self-storage units, however, food items with expiration dates that will begin to rapidly decompose should not be kept in storage because it will inevitably attract pests and vermin and may result in an infestation – one which could spread to adjacent units – that damages both your property and potentially that of other people as well, which raises all sorts of unpleasant liability issues. Sensitive electronic devices. Most self-storage units do not come standard with climate control installed and therefore tend to fluctuate between very hot and very cold during the summer and winter months which could damage or render useless any electronics you’ve stored. If you are planning on storing electronic devices in your unit, make sure you choose a unit that comes with climate control. Plants. Plants fall under the umbrella of organic matter. Most plants require a constant, reliable source of light and regulated temperature ranges in order to properly photosynthesize and thrive. If you leave plants in a dark, overly hot, or overly cold self-storage unit, chances are, they are not going to last long. Valuables. We’ve all seen shows like “Storage Wars.” People paying pennies on the dollar for repossessed storage units in the hope that they will stumble upon buried treasure, only to find that the previous owner’s family heirlooms, antiques and collector items have been all but disintegrated by the extreme temperature conditions inside of the unit. It is tempting to treat a self-storage unit as simply an extension of the space you don’t currently have in your home or business and investing in a self-storage unit can be very helpful if you are short on space. 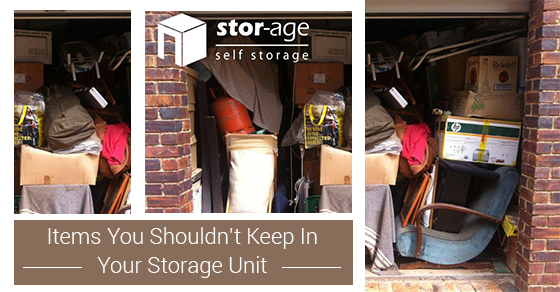 That being said, knowing what should and should not be kept inside, especially if it is your first time renting storage space, can mean the difference between added convenience and damaged goods.